A new wide-field panorama reveals more than a thousand supermassive black holes in the centers of galaxies, some up to several billion times more massive than the sun. This survey, taken in a region of the Bootes constellation, involved 126 separate Chandra exposures of 5,000-seconds each, making it the largest contiguous field ever obtained by the observatory. At 9.3 square degrees, it is over 40 times larger than the full moon seen on the night sky, which is also shown in this graphic for scale. In this image, the red represents low-energy X-rays, green shows the medium range, and blue the higher energy X-rays. Material falling into these black holes at high rates generates huge amounts of light that can be detected in different wavelengths. These systems are known as active galactic nuclei, or AGN. 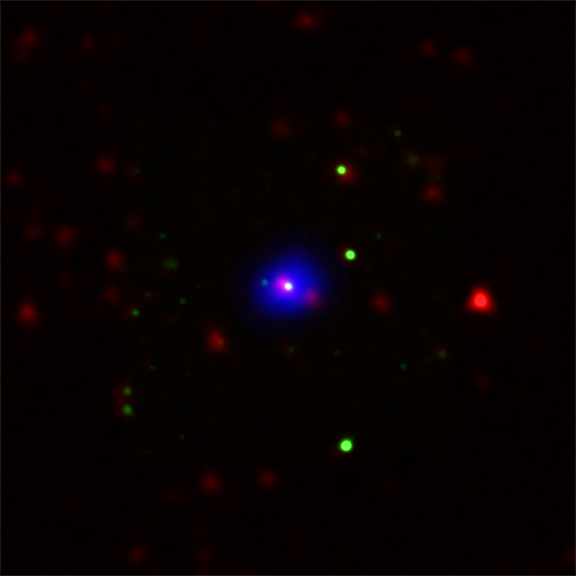 When combined with data from the Spitzer Space Telescope and Kitt Peak's 4-meter Mayall and the MMT 6.5-meter optical telescopes, these results give astronomers a snapshot of a crucial period when these monster black holes are growing, and provide insight into the environments in which they occur. 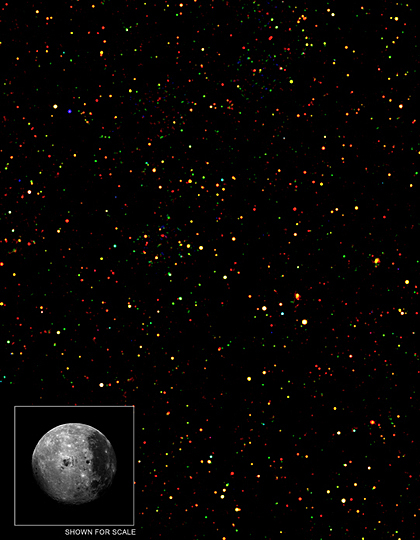 Instead of staring at one relatively small part of the sky for a long time, as with the Chandra Deep Fields -- two of the longest exposures obtained with the observatory -- and other concentrated surveys, this strategy employed a technique that scanned a much bigger portion with shorter exposures. Since the biggest black holes power the brightest AGN, they can be spotted at vast distances, even with short exposures. Black hole not enshrouded by this ring of material, and, therefore, emits X-ray, infrared, and optical (green) radiation. Credit: X-ray: NASA/CXC/CfA/R.Hickox et al. ; Infrared: NASA/JPL/Caltech/P.Eisenhardt & D.Stern et al. ; Optical: NOAO/B.Jannuzi & A.Dey et al. The survey gives a new test of a popular model for AGN in which a supermassive black hole is surrounded by a doughnut-shaped region, or torus, of gas. An observer from Earth would have their view blocked by this torus by different amounts, depending on the orientation of the torus, so some of the nuclei will be obscured and some won't. This study identified more than 600 obscured and 700 unobscured AGN, located between about six to 11 billion light years from Earth. The red sources are mostly unobscured AGN and the green and blue sources are dominated by obscured AGN. Written from a news release by Chandra X-Ray Obervatory.